A fast-moving fire completely destroyed a home in Bowdoinham on Saturday afternoon. 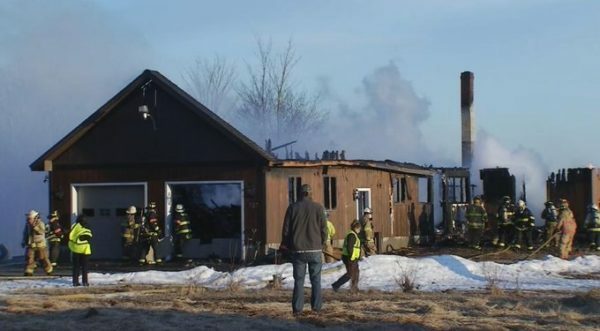 A fire tore through a home in Bowdoinham on Saturday afternoon leaving it completely destroyed, according to the Bowdoinham Fire Department. Firefighters said they were called to the home along Ridge Road around 5 p.m., and when they arrived, the flames were shooting through the roof. No one was at home when the fire broke out but a neighbor was able to help the dogs that were inside escape safely, according to fire officials. Crews from a number of departments were on scene through the afternoon to help contain the fire. Investigators have not determined what caused the fire but believe Saturday’s strong winds contributed to it spreading.